Nine-year-old Milo has retinitis pigmentosa, a degenerative eye disease which causes decreased sight until ultimate blindness. However, this doesn't stop him from noticing when the care home his Gran is moved into proves to be run by a Nurse who has no qualms about mistreating the elderly who live there. While Milo's mother wallows in the wake of her husband leaving her for another woman, Milo is focused only on the need to rescue his Gran. This is a warm and occasionally humorous story told with alternate focus on Milo, his mother (Sandy), his Gran (Lou), and Tripi (the Syrian refugee who works as a chef at the care home). While not a first person narrative, this structure allows for the reader to hear individual's private thoughts and feelings as they deal with their personal struggles. Whether it's Sandy's frustration at her husband's betrayal, Tripi's anxiety about his sister who is lost in Syria, or Lou's worries over her ability to function, Macgregor explores these with great sensitivity. 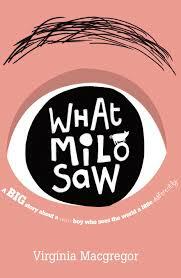 The style and quality of the narrative sections which focus on Milo are reminiscent of authors such as Gavin Extence and Mark Haddon who have previously brought us "different" young characters. In this case, Milo's unique perspective comes from his failing sight. While this is a good book, it has a certain predictability which prevented me from enjoying it as much as books such as Extence's The Universe Versus Alex Woods. If you're looking for an easy read which touches on some timely contemporary issues (the plight of Syrian refugees, mistreatment of the elderly), this is for you. Thanks to the publishers who provided me with an advanced copy of this book via Netgalley in exchange for an honest review.